I hadn’t visited Jersey Mike’s Subs since they opened their first New York City location on Maiden Lane (btw. William & Pearl) last July. That initial visit showed they did a good job with sub sandwiches at a cheaper price than nearby Dave’s Hoagies. An overlooked part of the menu is the breakfast sandwiches, which are available all day and are cheap. 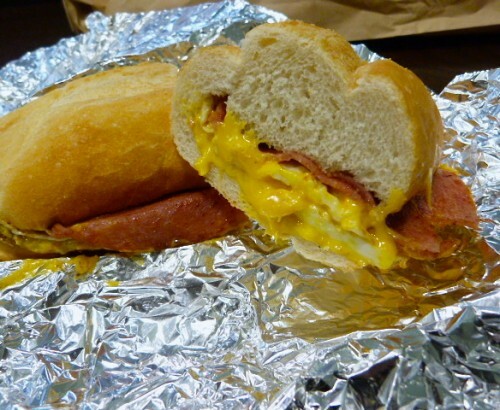 One of the items on that menu involves Trenton pork roll, eggs and cheese and it is worth your stomach space. Say you’re hungover one day and want some salty meat, egg and cheese on carbs come lunch time. The pork roll sandwich ($4.25) has all of those things! The meat looks kind of like dark Canadian bacon but tastes more like a thinly-sliced version of SPAM. Whatever it is (and you probably don’t want to know the exact ingredients) it goes nicely with the melted American cheese and two eggs on the same roll that you’ll find with the other subs on the menu. There’s not a whole lot else to say about this sandwich, except that I appreciated that the cheese was fully melted and evenly distributed among the egg and pork roll. Otherwise, revel in all of the salt and grease happening in this sandwich if you had a rough night or morning, or feel you have been eating too healthfully lately. Dave’s Hoagies looks good, but they aren’t on Seamless and their homegrown online delivery option isn’t HTTPS. I’m not transmitting my creditcard in plaintext. Non-starter. 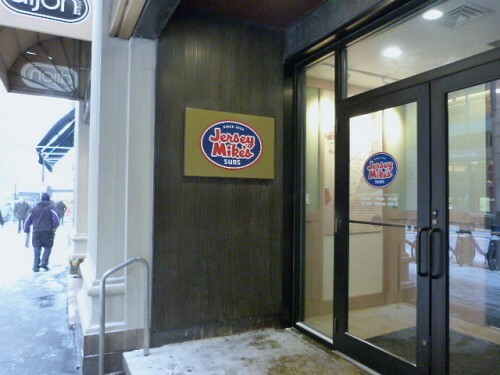 Jersey Mike’s apparently doesn’t offer online ordering in NYC at all. It’s crazy, really. This is 2014, I don’t want to call up and give my creditcard over the phone like an animal. These restaurants are in NYC, in the financial district. All the big banks like Goldman, etc, have Seamless accounts so their suits can order freely. They’re leaving tons of money on the table. If I remember correctly, Shorty’s only serves their breakfast sandwich until 11 a.m., so not exactly a lunch item. I thought it was nice that Jersey Mike’s had them available all day.